Awareness-raising will almost always be a core element of your advocacy activities. You may have to focus more on awareness-raising in the early stages of implementing your advocacy strategy – especially on an issue such as tax on which there is often little understanding. However, don’t think that you need to separate awareness-raising from lobbying and campaigning or that you can’t do any campaigning or lobbying until you have raised awareness. Always give your target – whether it is an ordinary citizen, a parliamentarian, or a government minister – something to do! Always give them the opportunity to act on the information you have given them. This approach will enable you to combine awareness-raising with campaigning and lobbying. build widespread support for your advocacy efforts. For example, most people know something about tax because they pay it, but they don’t necessarily see it as a development issue that can have a direct impact on poverty. 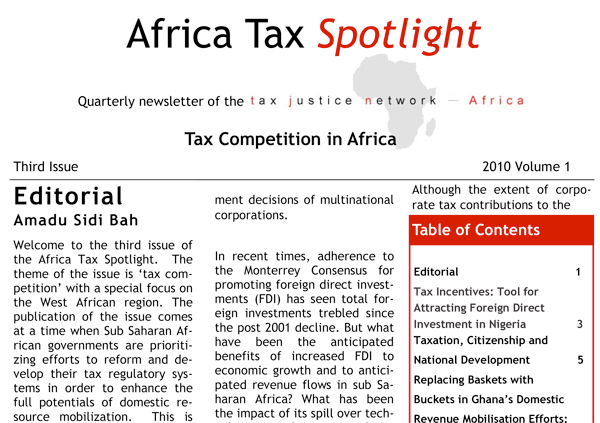 Tax Justice Network Africa launched a quarterly newsletter on tax justice issues in Africa, in January 2010. The newsletter is widely disseminated to civil society organisations, researchers and journalists interested in economic justice issues and has been a key tool for raising awareness, across the continent and beyond, of the critical links between tax and development. It is essential to remember that awareness-raising is a means to an end, not an end in itself. Because advocacy is about achieving change, it is not enough to stop at awareness-raising; you must build from there and encourage people to act. Rather than simply telling your audience that you’re going on a journey, you need to tell them why, ask them to join you, share ideas for different directions and the benefits of the final destination.